Sizes available: 236 ml, 473 ml. 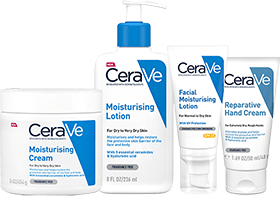 All CeraVe products contain essential ceramides healthy skin needs to help maintain its natural barrier. A gentle, foaming gel cleanser for normal to oily skin on the face and body. disrupting the protective skin barrier of the face. Contains 3 essential ceramides, niacinamide, & hyaluronic acid. Long lasting hydration for up to 24 hours. 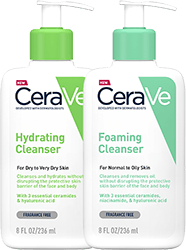 All CeraVe products undergo rigorous dermatological testing to ensure they are suitable for use on even the most sensitive skin. Moisturises and helps protect skin barrier. Lightweight eye cream for normal to dry skin enriched with 3 essential ceramides to help protect skin’s natural barrier. A lightweight facial moisturising lotion with SPF25 for normal to dry skin enriched with 3 essential ceramides to protect the skin’s natural barrier. A lightweight facial moisturising lotion for normal to dry skin enriched with 3 essential ceramides to help protect the skin’s natural barrier.